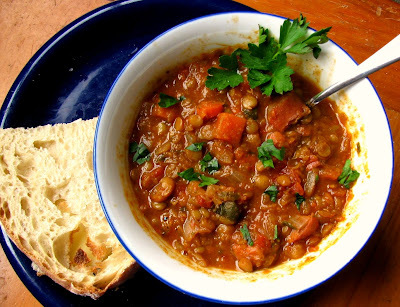 natalie's sentiments: Ina's Lentil and Sausage Soup - Please tell me you will make it. Ina's Lentil and Sausage Soup - Please tell me you will make it. Serve with crusty bread and salad. Better the next day. YUM! Make sure to enter my latest giveaway! Ends tonight at midnight! Natalie, thank you so much for visiting Rook No. 17 and for entering my contest. I love your blog. This recipe looks fabulous. Lentil soup is one of my favorites. I was reading Dr. Sears Healthy Families book recently and he was definitely pro-Lentil. I look forward to exploring your blog further. I tell you I will make it! But without the sausage. Does that count? OH I WILL SOOOOOOOO BE MAKING THAT!!! I lost my fave lentil soup recipe just in time for fall!!! THAT'S FINALLY HERE!!!!! That looks amazing!!! I love Puy Lentils--they are my new favorite--the others don't even compare. Yesterday was so much fun--loved having you guys down! The soup looks perfect for the fall.